Many sites have a really cool hidden slide out menu panel which contains some relevant information and this panel is revealed to us, with a cool animation, when we click on a particular button or hover over it. This has usually been achieved using jQuery. But now as we advent towards the future and CSS3 is becoming a reality, here is a tutorial on how to build an animated slide out panel using only CSS3. Note: This tutorial uses some advanced css3 techniques which are not yet supported in Firefox. To get the full version, you should see the live demo in a web-kit engine for example Safari and Chrome. You can download the source code here. The final demo can also be seen here. This slide out content panel can be used for various purposes. We can see today, that there is a lot of hidden menus or content that can be revealed to us, by hovering over a button or by clicking on the button. With no further ado let’s dig in! Now once the viewer hovers over the subscribe button on the top right hand corner, the whole hidden panel will come sliding down with a very smooth animation effect revealing the subscribing options to the visitor. 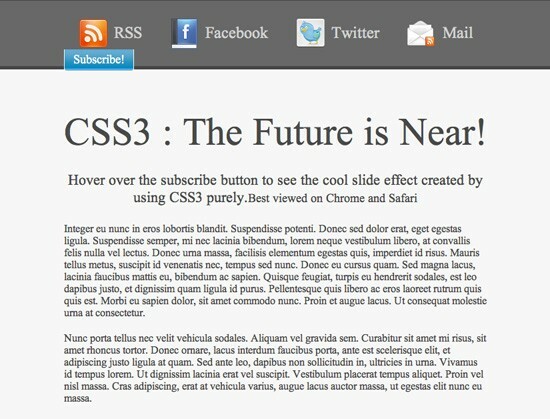 &lt;h1&gt;CSS3 : The Future is Near! Integer eu nunc in eros lobortis blandit. Suspendisse potenti. page wrap class to keep them aligned centered in the screen. The style-sheet just contains some simple styling of the page. As explained above, there will be one slide-out division, one main container and one page-wrap class. These forms the basic styling elements of our page which give it the look we want. Now that the basic styling of the page is done, we have to set the stage for the panel to hide and show. To achieve that, the first thing we need to do is get the subscribe hyperlink to the bottom right corner of the slide-out division such that it is just peeping out of it. To do this, we have to manipulate the button class in the style-sheet a bit. We are going to make its positioning absolute and then give its right attribute a value of 0px. This will push the subscribe button to the right of the division as shown in the image below. negative 63px value to the bottom attribute. We all hate Internet Explorer 6 a lot because we always have to add some extra code especially for it. In this case also we would have to do the same. To make the layout look the same as in the other browsers, we have to add some IE6 specific styling at the top of our html page, in the head section. Now that the slide-out panel is hidden, our task is to enable the hover event on the subscribe button such that the slide-out div reveals itself from the top of the page. You might ask why we have put the subscribe link in the slide-out panel and pushed it outside into the main container, rather than placing it in the main container itself. The reason behind it is that, we have assigned a negative margin to the slide-out div and pushed it out of the screen. To make it visible again, we have allotted a hover event on it which makes it margin back to 0. As the slide-out div is out of the screen, so it is a difficult process to hover over it. Now because the subscribe hyperlink is actually inside the slide-out div, hence hovering over the subscribe link also acts as a hover event of the slide-out dive making its top-margin 0 and revealing it. Step 4: The CSS3 Factor! The main drawback of this method at present is that CSS3 transition effect is only supported by webkit browsers like Google’s Chrome, Apple’s Safari and Opera. Even though the slide-out panel on hover would work on other browsers like Firefox and Internet Explorer, but the animation wont work in them. The other drawback is that it wont work on Internet Explorer 6.0 because it doesn’t support the CSS hover event. But there is obviously a solution for this. Now let’s take on another tutorial about pop up menu. Ready? Alright. Modern websites offer a more complex hierarchy of navigation. This navigation sometimes makes user-experience on the website’s menu a bit confusing. 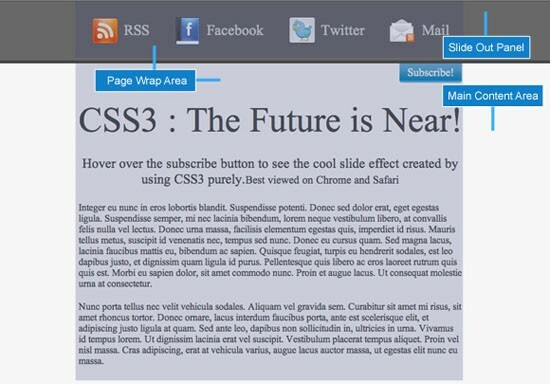 Using a CSS3 pop-out menu makes it easier to find your way to what you want on the site quickly. 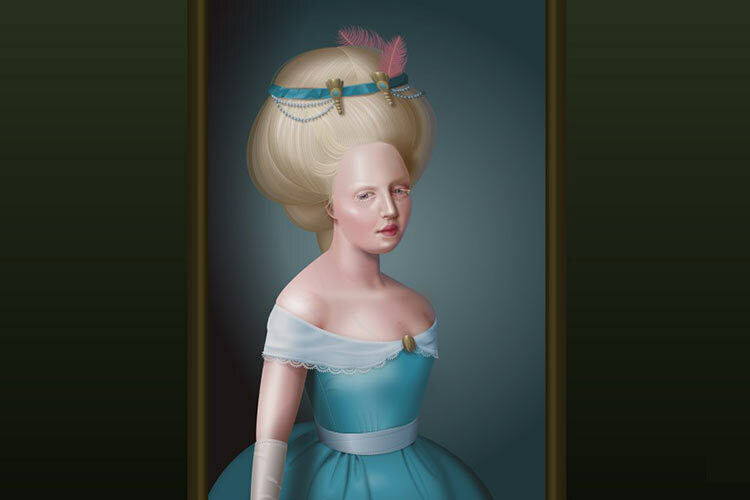 Thanks to CSS3, animation is now possible. 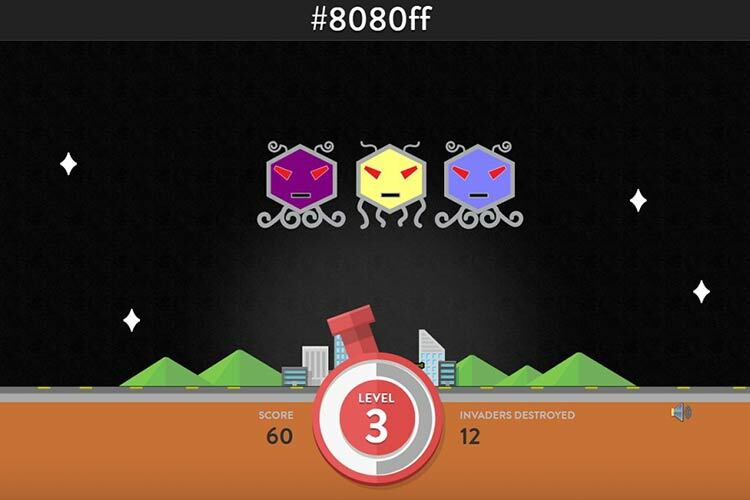 Using CSS3, you can simply hide and unhide an element under other elements. This will not only simplify your code but also makes it easily updated. This means you can now perform some sliding animation even without the knowledge of programming. In this tutorial I will show you how to create a metro type menu that hides and unhides the text menu under the icons each time you mouse over it. OK, let’s rock! Download the 80 Shades of White Icons. For this tutorial, we’ll be using the following icons. Using these icons, we’ll be creating a sprite image for the icons of our menu. First, drag the Home icon on a new Photoshop file. Then go to Image -> Canvas Size and then add another 16px width on the left side. Make sure that the anchors are pointing to the right. After that, place the User icon to the right side. Make sure you align them to the right properly. You can do this by pressing Ctrl – A on your keyboard and clicking the align right edges button on the Align panel. Next, repeat the same process for the rest of the icons and then finally save it as a png file. For our HTML file, we will first add the HTML5 doctype and series of links in our head section. This will include our CSS link files. The menu elements are wrapped inside an unordered list. Each element has a class of box, followed by an anchor tag, span icons and an H2 tag (for the title of the element). All of our menu is wrapped in a container class. After we set up our HTML markup, we should have something like this. Now it’s time for our pop-out menu to shine. First, let’s import the font that we’ll be using on our menu elements and titles. Let’s now add the styles for our general settings. First we will add a background with hexadecimal color of #263544 and a font face of Museo 500. And then, we will also set some styles for our anchor and H2 tags. Next, let’s add some styles to our icon boxes where we will be hiding our text menu. Using the unordered list, let’s style the class icon-menu to hold all of our icon menu. Then, let’s style the class icon-box and give it a dimension of 120px x 120px. Now let’s use the menu name as its class to manipulate the background color of each box according to its title. After that, let’s also set the positions of our menu icons using our sprite images. We will use the span tag and attach the icon class name to it and manipulate its position. For our menu name, we will use the H2 tags as our anchor tag and and we’ll set the position to absolute and then push it to the left. Using the style method z-index, we will hide the menu under its menu icon and box. And I think that’s it! By this you’ll have the same output like the one you see on our finish product above.